and adjust the textures directly on the model. I always struggled with making even simple models for my 3d games. Learning to model in SketchUp for example is very easy - unfortunately same cannot be said about texturing. I never quite liked 3d Studio's uv mapping and the whole workflow scheme pushed me back every time I wanted a quick texture to be done. So I have written a small tool to makes things easier! Maybe it doesn't allow as much freedom as some major applications, but it's fun to use and easy to learn. And you can then export the model with it's textures nicely packed together for use in your games immediately! The editor reads and exports .obj files currently (Wavelength model format) - it's a simple and open standard, handled by many 3d modeling programs out there. You can paint on the whole model using a few basic tools, you can also edit UV coordinates of each face inside a handy 2D Texture Editor. 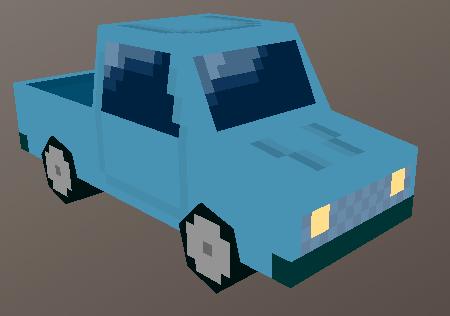 You choose an .obj model to load, then you set the texture scale (originally 1 unit in model-units is 1 pixel, but different programs tend to export in a different way) and you are ready to paint! The program automatically generates faces and puts empty textures on them. Faces are created with coplanar triangles, or to be more exact - adjacent triangles that have the same normal, so it is possible to have curved faces, as long as the normals in the file are the same. There are some cool features, for example references which allow you to share the same texture by multiple faces, thus saving final compiled texture space. Just look into short manual and eveything will be clear! Wow, this looks pretty cool, dude, nice work! unfortunately same cannot be said about texturing. I never quite liked 3d Studio's uv mapping and the whole workflow scheme pushed me back every time I wanted a quick texture to be done. This is really... really... really... cool. Pixel art for 3D models in a very intuitive way. You should totally do something bigger with this than just post a link in a forum. Or at least make sure it's on one of those Big Lists. This truly is an excellent idea, especially for those who are just getting into 3D with Unity or somesuch. I'm gonna try this out ASAP. I usually use Blender, but UV unwrapping is one of my least favorite things, and this is the sort of style I like to use on my low-res models, so this is perfect for me. I love getting new editing apps to play around with. I also am a huge fan of that thread, especially tennis' and madPXL's stuff. It's cool, but does not work. Every time I open a .obj file the units are ridiculous random numbers. I am just trying to open the models in the /obj directory. This is probably one of the best ideas ever. Unfortunately I get the exact same error as Lord Tim, using Vista 64-bit. I get the same problem on Win 7 64bit. I tried running it in XP service pack 2 compatibility mode and it did the same thing. But it can load the project for the hummer just fine. If they're floating point computations then it's not strange at all. Oh wow, this looks like just the thing I wanted. Now I just need a nice way of rendering these things. EDIT: Can we have a camera that rotates around the center? any chance of providing a .zip version? I'd like to try this out.